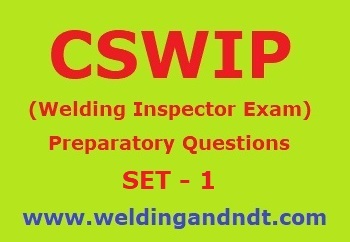 Any irregularity (discontinuity or flaw) in the weld metal, which exceeds the applicable code limit, is termed as a WELD DEFECT (or Welding Defect). 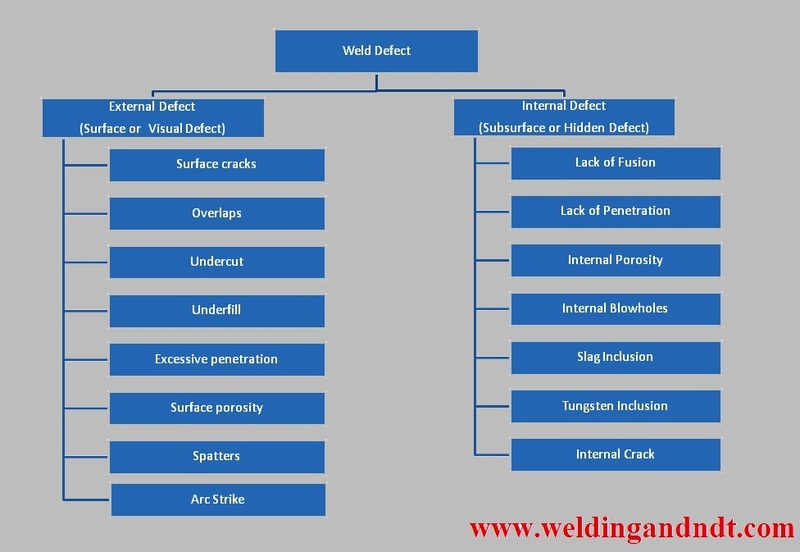 Please note that a discontinuity can be termed as a defect only when, if it exceeds the specified code limit, hence we can say that every defect present in a weld metal is a discontinuity but every discontinuity present in the weld metal may not necessarily be a defect. A defect can be macroscopic or microscopic. 1. CRACKS: It is the most dangerous of all defects. Cracks may be of any size or shape; it can be either microscopic or macroscopic. Cracks may appear anywhere i.e. on the surface, subsurface, at any depth or at the root. Crack occurs when the localized stress exceeds the ultimate Tensile Stress (UTS) of the material. It may propagate within the material. HOT CRACK: Hot cracks occurs during welding or soon after completion of welding, It is most likely to occur during the solidification of the molten weld pool. Hot cracks mostly occur in the weld metal but it may occur at the Heat Affected Zone (HAZ) region too. When hot crack occurs on the weld metal then it is termed as Solidification Crack and if it occurs in the HAZ then called as Liquation crack. COLD CRACK: Cold cracks occur after the solidification of weld metal; it can even develop several days after completion of welding. Most of the time it develops in the HAZ but may occur on the weld metal too. It is often associated with non-metallic inclusion. 1. Diffusion of Hydrogen atoms: Hydrogen atoms cause cold cracking. These hydrogen atoms may be induced in the weld metal from the surrounding, electrode, base metal or any contamination present on the root face. 2. Lack of Preheating: Due to inadequate preheating, microstructural changes may take place. Microstructural crystals may re-structure itself to form martensite. Matensite is very prone to cracks. Preheating also helps in reducing diffusion of hydrogen atoms and ensures no moisture on the joint before welding. STAR CRACK (CRATER CRACK): Star crack is a type of hot crack and it develops at the crater on the weld metal. A crater is a depression formed on the weld bead where arc gets broken or when electrode is changed. 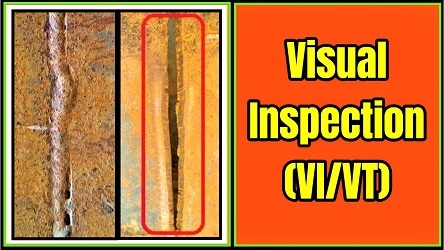 It develops when center of the weld pool solidifies before its surrounding and due to this the center pulls the outer weld and thus star cracks are formed. 2. POROSITY/BLOW HOLES: Porosity is a small pore or void whereas blowholes are comparatively larger hole or cavity. It may be present on the surface or inside the weld metal. Porosity can occur individually or it may occur in groups also (mostly), group of porosity is known as cluster porosity. 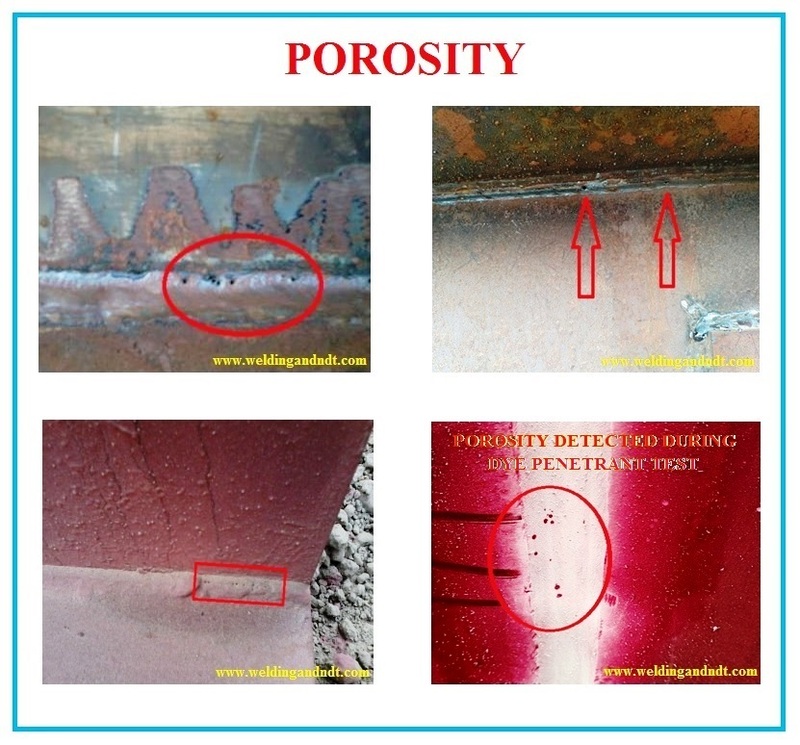 Porosity occurs due to the entrapment of gases in the molten weld pool, these entrapped gases doesn’t get a chance to release and hence causes porosity or blowhole. Gases which are entrapped are mostly Hydrogen, Carbon mono oxide, Carbon dioxide, Nitrogen and Oxygen. Source of these gases are fluxes present on the welding electrode, Moisture, Oil, Grease other foreign contaminants present on the joint etc. 3. UNDERCUT: Undercut appears as a narrow groove on the base metal adjacent to the weld metal along the edge. Undercut always runs parallel to the weld metal. It acts as a stress raiser during fatigue loading. 4. UNDERFILL: When the weld metal surface remains below the adjacent surface of the base metal then it is called as an underfill. 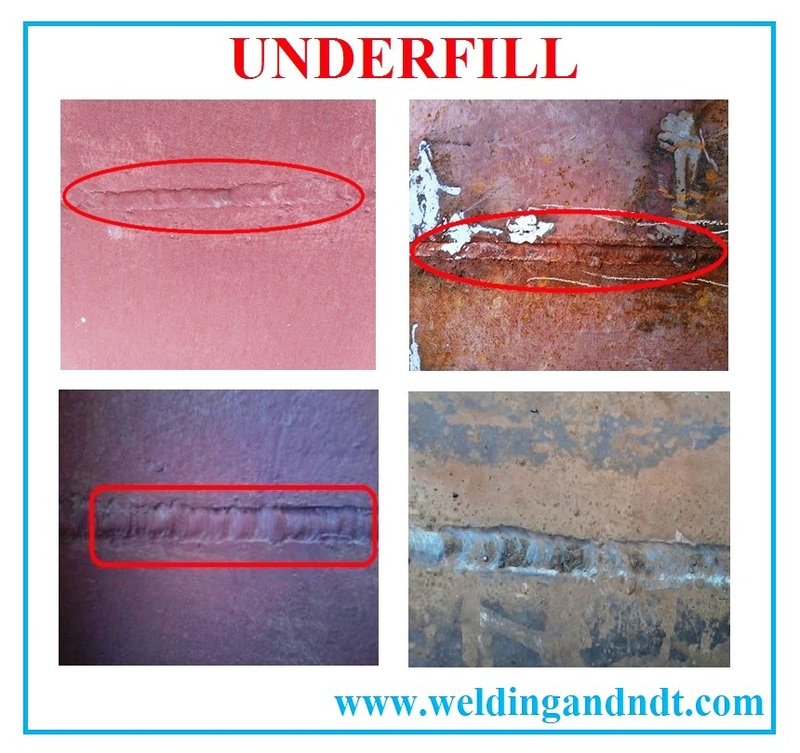 Underfill is an undersized welding. 5. 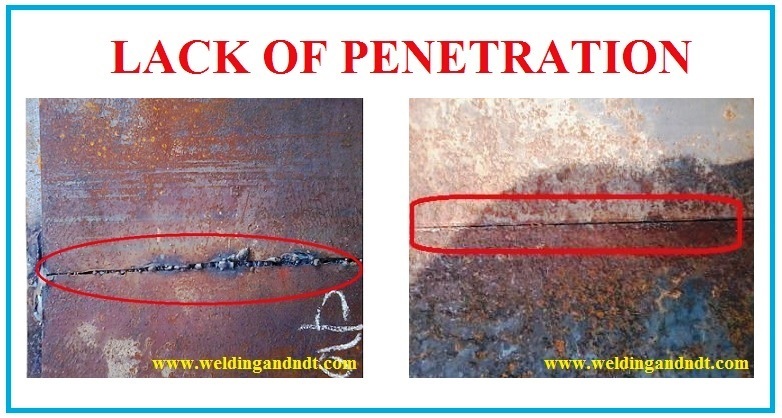 LACK OF PENETRATION: When the weld metal doesn’t completely penetrate the joint, then it is called as Lack of Penetration of Incomplete Penetration. It is one of the most dangerous defects, since it acts as a stress raiser and hence crack may originate or propagate from here. 1. Proper joint preparation i.e. providing a suitable root gap. Lack of penetration can be repaired by proper back gouging. 6. LACK OF FUSION: It is the lack of proper melting (or proper fusion) either between the weld metal with the base metal or one layer of the weld with the other layer. Lack of fusion is also called as Cold lapping or cold shuts. 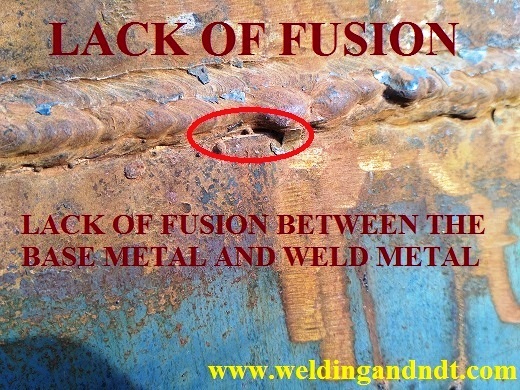 One of the most prominent reasons for the cause of lack of fusion is poor welding technique. Lack of fusion is an internal defect, but it can occur on the external surface too, if the sidewall of parent metal doesn’t get properly fused with the base metal, as shown in the below figure and for this case lack of fusion can also be called as ‘lack of sidewall fusion’. 7. 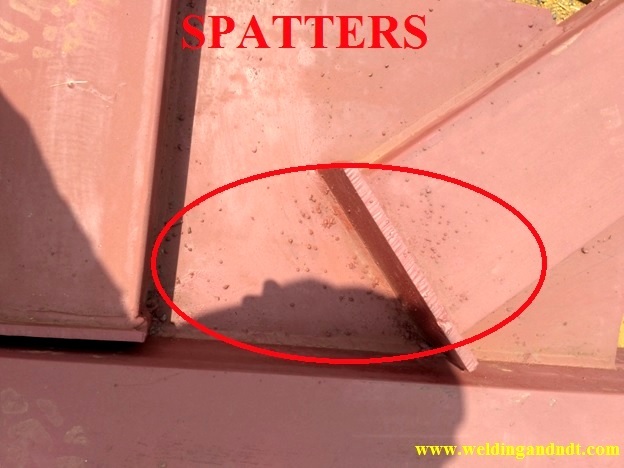 SPATTERS: Spatters are small globular metal droplets (of weld metal) splashed out on the base metal during welding. Spatters stick on the base metal hence can be removed by wire brush or buffing. 8. OVERLAP: Overlap occurs due to the overflow of weld metal on the surface of base metal. During welding, molten metal overflows on the base metal without fusing with the base metal. 9. EXCESSIVE PENETRATION: When the penetration of weld metal is too high through the joints then it is called as excessive penetration. It acts as notch where stress concentration takes place. In addition to this it results in economical wastage. 10. INCLUSION: Entrapment of any foreign material (either metallic or non metallic) in the weld metal is called as inclusion. If slag doesn’t get a chance to float over the surface of molten weld pool, then it gets entrapped within the weld metal such inclusion is called as slag inclusion. Similarly, sometimes droplets of tungsten get entrapped within the weld metal resulting in tungsten inclusion (in TIG welding). Sulphides, oxides and silicates also get entrapped resulting in inclusion. Inclusion acts as a stress raiser hence should be avoided. 11. WAGON TRACKS: Linear slag inclusion along the axis of the weld is called as wagon tracks. During root pass a groove is formed at the toe, due to wrong welding techniques, and that groove is filled by slag (especially Hydrogen which has been trapped by the solidified slag) and thus wagon tracks are formed. It is also known as worm tracking. 12. ARC STRIKE: When the electrode or the electrode holder, unintentionally or accidentally strikes with the work piece, an unwanted arc is generated causing arc strike. Arc strikes may initiate failure in bending and cyclic loading. In addition to this is affects the aesthetics of the work piece. 13. SHRINKAGE CAVITY: During solidification of the molten weld pool, metal shrinkage occurs. Due to the shrinkage of weld metal a cavity is formed known as shrinkage cavity. One defect I never new the cause of. Worm hole porosity in FCAW welding. Can you comment ? Happens especially when on a T joint on side is welded already and you weld the other side and the gas gets trapped under the plate. 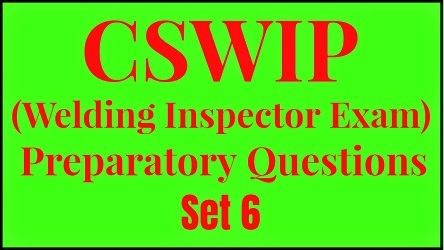 Dear Sir, Thanking for basic knowledge of Welding defact. Thanks. Porosity came in ss welding by 309l what to do?